I decided to do the afternoon of today separate because we did something completely different, and then add the work at the hospital in the morning to the post tomorrow. Today, after being at the hosp ital, Rebecca and I decided to go ahead and get lunch in Pochutla instead of riding back hungry to Puerto Escondido. Well, we went to a small taco place across the street from the hospital where we saw some of the doctors that we had shadowed. For only $1.50, I got two two chicken and onion tacos with tortillas made just for me, and two helpings of rice and beans. Amazingly delicious and very affordable. 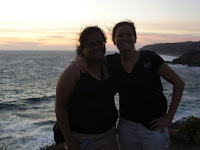 Kind of on a whim, we decided to take a colectivo to a small beach town in between Pochutla and Puerto Escondido. A colectivo is a pickup truck that has a little canopy in the back with wooden benches. People pile into them to get to various places quickly and cheaply. You ride with all sorts of people from school children, vaqueros (cowboys), and little old ladies to chickens and construction tools. You just hop on a knock on the window when you get off and they tell you how much it cost. I'll have to take a picture of one before I leave. 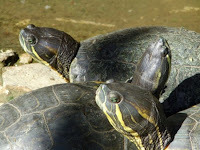 Well, anyway we went to a turtle conservation aquarium where you can see various types of turtles native to Mexico. 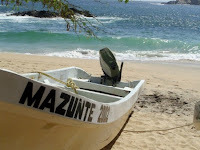 The little pueblito of Mazunte (pop. 450) used to be dependent on hunting turtles. This was outlawed in 1990 and various coop and sustainable development projects were started in the town to offset this huge blow to the towns economic stability. This turtle park brings in many tourists to the area which help the economy and bring more recognition to its amazing beaches and vistas. We saw many kinds of turtles and even a seal. Apparently, this seal is a cold-water seal that somehow found its way to Mexico. It was found on a beach poor thing and they decided to bring him to the aquarium until they can figure out waht to do with him. He's just a little guy, but he seemed really confused of why he couldn't get out of his tank :( They had HUGE marine turtles and various kinds of desert turtles too (are those tortoises? not sure). 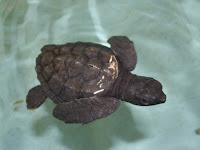 They also some turtle babies to help in the conservation efforts. So cute! We stopped by a natural cosmetic products coop that was created for the people in the town. They use natural and organic things found in the area and with help from the Body Shop they were able to create this great little store where you can get various products pretty inexpensively. 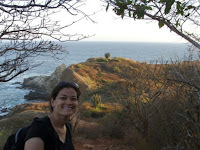 Then we walked to Playa Mazunte. I have to tell you that it is absolutely gorgeous. 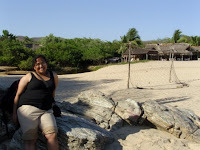 There are little cabanas lining the side of the beach, but other than that, it is very tranquil and beautiful. We enjoyed ourselves, rolled our hospital khakis up and got a little wet. 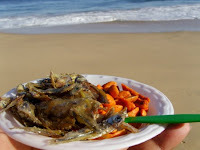 We also got some snacks to enjoy on the beach as we laid on the rocks to dry off. 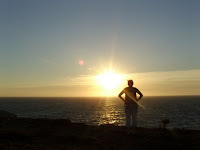 In Rebecca's Lonely Planet book, they talked of an awesome sunset spot called Punta Cometa. 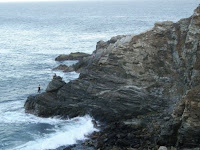 It is a 30 minute hike to the top, but it is so worth it. 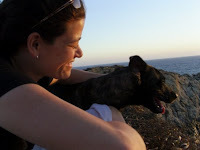 This adorable blackish-brown doggie came with us the whole way and made sure that we got there ^^ The forest there was kind of dry because it is the dry season, but it was nice see more green. There were also these HUGE cacti when we got to the top. 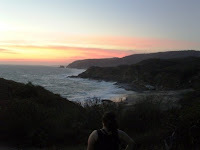 We sat on Punta Cometa and watched the sunset. 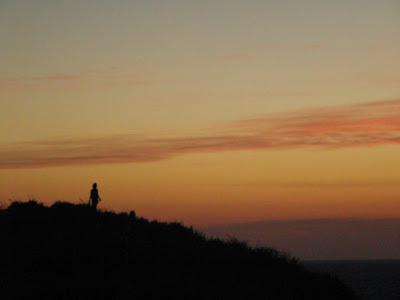 We didn't have a flashlight to get back so we left before we wanted to and as we were walking back the sunset just got better and better, but we made sure to turn around to get more pictures. 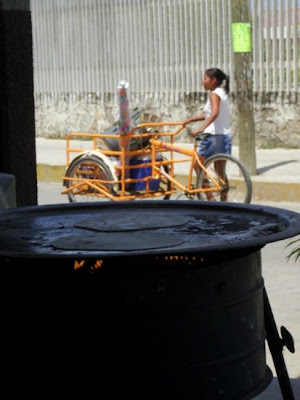 It was kind of an issue getting a colectivo back to the carretera (highway), but when we got there we chatted with a taxi driver until our bus got there. People in Mexico are jus so friendly. They love to talk to people and ask tons of questions. It's a great way to practice Spanish. Got back at 9pm, had an awesome dinner cooked by our host mother. All in all, an amazing day and definitely worth getting my khakis filthy!